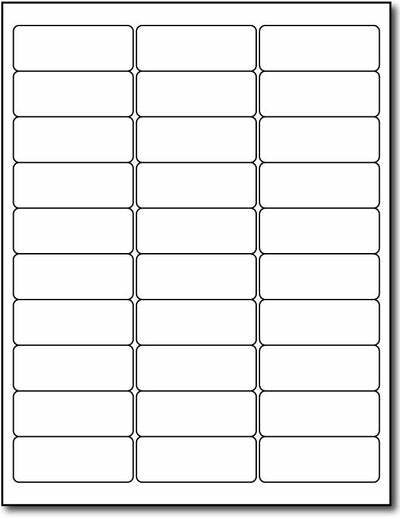 Labels Measure - 1" X 2 5/8"
Our Desktop Publishing Supplies Brand Glossy Inkjet 30 Up labels are specifically designed for inkjet printers. These glossy inkjet labels come on an 8 1/2" x 11" sheet and come 30 per page. The inkjet glossy labels have a white background. Each inkjet label measures 2 5/8" X 1". These inkjet labels can easily be used to print your own Photo Quality Glossy Labels using any label or graphic arts program. Note: Our Glossy Inkjet Labels are not made by Avery®, but are comparable to Avery® Layouts. These Glossy Inkjet Labels are compared to Avery® layout #5160™ Avery Dennison product code numbers are trademarks of Avery Dennison Item Group# 67160 Product features Glossy Inkjet Labels 30 Up labels - 2 5/8" X 1" labels - 8 1/2" x 11" Sheet Use with inkjet printers ONLY. Available in 10 or 100 Sheet Packs.